How to Give a Trip as a Gift in a Fun Way- Live Free Creative Co. Giving experiences as gifts is widely accepted as a wonderful alternative to giving material objects. But have you ever wondered how to give a trip as a gift, and have it still be thrilling and fun to open? Our family has given trips as gifts to each other for years, using all different types of ideas for the giving. Giving a trip as a gift can be much more fun than just handing someone an envelope with plane tickets (although, that’s not a bad place to begin.) I wanted to share some tips for giving a trip as a gift in ways that make both the opening and the trip itself really fun. Make opening the gift an experience of it’s own. One of the challenges with giving an trip as a gift is making it fun to actually open. Especially on holiday with big expectations, like Christmas morning, you want your kids to be over the moon about their presents, not confused why they only got this piece of paper saying they’re headed out of town. Wrap in multiple boxes and with different paper. Make it a treasure hunt with clues. Go big with a box filled with helium balloons or beach balls. Fill a stocking with different items that give clues as to the location. Wrap a piece of twine or yarn all around the room or house (or yard) that the recipient has to follow to get to the trip at the end. 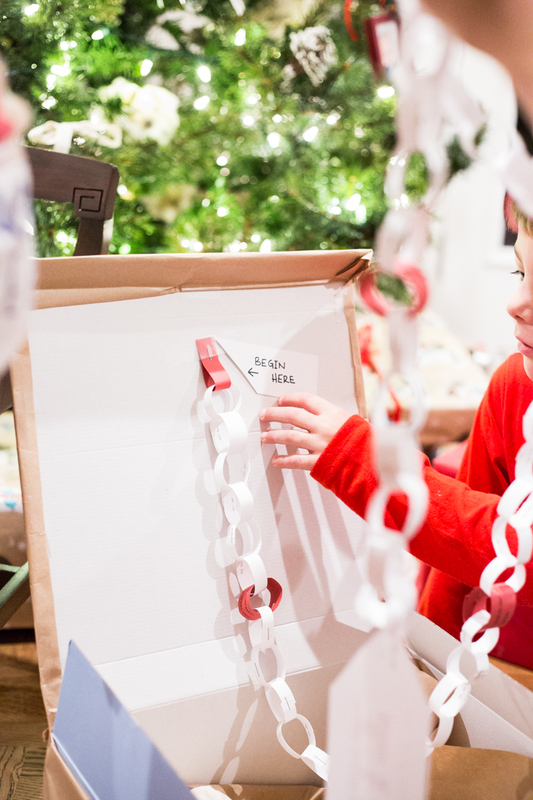 You want the kids (or friend, spouse, partner) to think the actual opening of the gift is a fun, unique, and magical experience! That way, even if you aren’t leaving on the trip right away, the gift opening moment feels special. One of the easiest ways to give a trip as a gift is to give some accessories that one may need for the trip along with the announcement. Wrap up a swimsuit and sunscreen for a trip to the beach. Give some new snow gloves and a hat for a ski trip. Buy a couple Disney tee shirts and mouse ears (for way less than you will at the park) and wrap them up to announce a trip to Disneyland. Get some food or drinks from the region or city to announce the trip. An instax mini camera is a great catch-all for a vacation gift opening, if you can’t think of anything else on theme! Another fun way to give a trip as a gift is to give some guide books, movies, or other items that will teach the recipient about the location before you go. It is always so much more fun to learn about a new place before you visit, and usually enhances the experience a lot. Planning to to some learning ahead of the trip can add so much to the fun of the gift! If you aren’t leaving on the trip for a while, a fun way to accomplish this one is with a paper chain counting down to the trip date. You can add experiences or adventures that will help you learn about the trip each week until you leave, making your gift even more impactful and long-lasting. First, we bought a few different Italian foods to pack up into different boxes. Then, we made a treasure hunt that began with the first gift box and a clue to the next one, and so on. 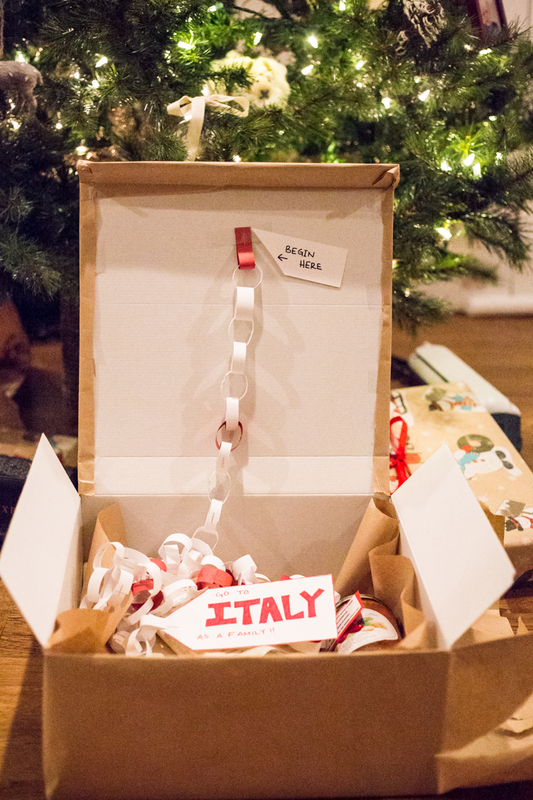 The kids were so excited to follow each clue and unwrap each different little Italian treat. After the kids had run around the house finding the clues, they were led back to the Christmas tree where we had left a big box. The chain had one link for each day until we leave, with red links on Mondays. We had come up with a family activity to complete each Monday for family night that would teach us something new about Italy! There are three weeks left until our trip, and so far we have: eaten Napoli style pizza, watched Italian opera, learned some Italian words, visited the Art Museum to look for Italian artists, celebrated Italian teams in the Olympics, made Italian Sodas, learned about Italian geography and watched a cartoon in Italian. We have yet to go driving to find Italian inspired architecture in our city, go get gelato, and learn about Italian fashion before we pack up to go. The kids had an amazing Christmas morning opening their gift with a treasure hunt, clues, treats, and this cool paper chain. And we have also continued to benefit each week from the gift as we learn, play, and experience things together to prepare us for the trip that is still ahead! I hope these ideas help you think of how to give a trip as a gift in a super fun way to someone you love. We’ll never regret the memories made!